AUGUSTINE, AURELIUS ST., the greatest of the Latin fathers, was born at Tagaste, a town of Numidia, on the 13th of November 354 A.D. His father, Patricius, was poor, but of good family, and filled the office of magistrate. Augustine was sent to school at Madura, and subsequently to Carthage to complete his studies. Previous to this however, he had enjoyed the inestimable felicity of a religious education at home. His mother, Monnica, had been his best instructor. Neander truly says: “whatever treasures of virtue and worth the life of faith, even of a soul trained by scientific culture, can bestow, was set before him in the example of his pious mother.” The energy and penetration of intellect exhibited by the young Augustine, excited the most flattering hopes. When he left home for Carthage, a joyous, ardent and resolute student, a bright career of worldly prosperity seemed to open before him. But strong as Augustine was, the temptations of Carthage were stronger. His nature, deep, impetuous, and passionate, thirsted for excitement. He had just reached the age when happiness was conceived to be synonymous with pleasure, and Carthage the second city of the empire, was as rank as Rome in its sensual corruptions. Augustine fell. In his confessions, he paints the frightful abyss into which he felt himself plunged. The thing which appears to have first stirred his deeper being into life was a passage which he suddenly came across in the Hortensius of Cicero, treating of the worth and dignity of philosophy. To use the language of Mander, the conflict now began in his soul, which lasted through eleven years of his life. As the simplicity of the sacred scriptures possessed no attractions for his taste, as moreover he found so many things in the doctrines of the church which, from want of inward experience, could not be otherwise than unintelligible to him, so under these circumstances, the delusive pretentions of the Manichaean sect, which instead of a blind belief on authority, held out the promise of clear knowledge and a satisfactory solution of all questions relating to things human and divine, presented the stronger attractions to his inexperienced youth. Augustine now became a professed Manichaean. Returning to his native town he lectured for a short time on literature. Soon afterward, he returned to Carthage, to pursue his profession under more favorable auspices. About the same time his spiritual nature became keener and more imperative in its demands. The futile speculations of the visionary sect to which he had attached himself now became apparent. He had a series of interviews and conversations with Faustus, one of the most celebrated teachers of Manichaeism; and these so utterly disappointed his expectations, that he left the society in disgust and sad bewilderment, after having wasted ten years in a fruitless search for wisdom and truth. In 383 he went to Rome, followed by the tears, the prayers, and the anxieties of his excellent mother, who was not however bereaved of hope, for both her faith and her love were strong. After a short stay, Augustine left Rome and proceeded to Milan, where he became a teacher of rhetoric. No change could have been more fortunate. At this time the Bishop of Milan was the eloquent and devout St. Abrose. An intimacy sprang up between the two. Augustine often went to hear his friend preach. Once more he studied the Bible, although from a purely Platonic point of view, and rather wished to find in it those truths which he had already made himself acquainted with from the Platonic philosophy, but presented in a different form. He began to think that Christ and Paul by their glorious life and death, their divine morality, their great holiness, and manifold virtues, must have enjoyed much of that “high wisdom” which the philosophers thought confined to themselves. For some time he clung to his Platonic Christianity, and shaped the doctrines of the Bible according to it; but when he found that it was weak to overcome temptations, and that “he himself was continually borne down by the ungodly impulses which he thought he had already subdued,” the necessity of a living, personal God and Saviour to rescue him from the condemnation of his own conscience, and impart a sanctifying vitality to the abstract truths which he worshipped, shone clear through all the stormy struggles of his heart. In the eighth and ninth books of his Confessions, he has left a noble though painful picture of his inward life during this momentous crisis. It is sufficient to say that the spirit of God triumphed. Shortly after he set out on his return home. At Ostia, on the Tiber, his beloved mother, who had followed him to Milan, died; her eyes had seen the salvation of her son, and she could depart in peace. It is unnecessary to relate at any length the subsequent life of Augustine, his character and principles of action had become fixed, and he now brought the whole majesty of his intellect to bear upon the side of Christianity. Having as was then customary for converts, divided his goods among the poor, he retired into private life, and wrote several treatises which secured him a high reputation. In 397, appeared his Confessions, in 13 books. It is a deep, earnest, and sacred autobiography of one of the greatest intellects the world has seen. Passages of it have no parallel except in the Psalms of David. In 413 he commenced his DeCivitate Dei (City of God), and finished it in 426. It is generally considered his most powerful work. In 428, Augustine published his Retractationes, in which he made a recension of all his previous writings. It is a work of great candor. He frankly acknowledges such errors and mistakes as he had discovered himself to have committed, explains and modifies numerous statements and modestly reviews his whole opinions. His end was now drawing nigh. In 429 the Vandals, under the barbarian Genseric, landed in Africa; next year they beseiged Hippo. 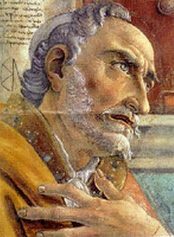 Augustine, now in his 76th year, prayed that God would help his unhappy church, and grant himself a relief out of this present evil world. He died on the 28th of August, 430, in the third month of the siege. No mind has exerted a greater influence on the church than that of Augustine. He held the corruption of human nature through the fall of man, and the consequent slavery of the human will. Both on metaphysical and religious grounds, he asserted the doctrines of predestination, from which he necessarily deduced the corollary doctrines of election and reprobation; and finally he strenuously supported, against the Pelagians, not only these opinions, but also the doctrine of the perseverance of the saints.